Nestled in tranquil Birds Eye Cove, on the sparkling blue waters of beautiful Maple Bay, you will find this extraordinary ten acre oceanfront property. A rare offering featuring a lovely combination of forest and pasture with 500+ feet of easy access waterfront, dock and foreshore lease. Boasting a sunny South West exposure, this fantastic location affords endless enjoyment of ocean activities: kayak, swim, sail, scuba dive or fish, all from the comfort and privacy of your own dock. A peaceful place to rest and recharge. Walk through magical forest paths dappled with sunlight while butterflies and birds circle above. Watch the maple leaves turn gold in Autumn, carpets of daffodils bloom in Spring, and St. John's Wort flower in Summer. Leave the turbulence of modern life behind and experience the serenity and wonder of nature in balance. Considered one of the prettiest bays on Vancouver Island, you can arrive at this special place by sea, sky or land: keep your vehicle at the nearby marina and sail to your property in minutes, land a float plane at your dock or come by car. A gardeners paradise. Cowichan enjoys the highest mean temperatures in Canada, and is known for it's rich fertile soil. The Salish name �Cowichan�, literally translates to mean 'The Warm Land'. This spacious level pasture would be an ideal location for a garden. Perfect as a summer getaway, this quaint pioneer-built log cabin provides a cozy 900 sq.ft. with two bedrooms. Positioned between Victoria and Nanaimo, and only ten minutes from the city of Duncan, this unique property offers the perfect mix of convenience and privacy. The Maple Bay Marina, with its yacht club, restaurants, and convenience store, is a great meeting point for mariners. Cowichan, famous for an enticing variety of recreational adventures, boasts world class golf courses and wineries. <?xml:namespace prefix = o ns = ''urn:schemas-microsoft-com:office:office'' /> Nearby Mount Tzouhalem's 5,000 hectare community forest and rare wildflower preserve offers excellent hiking, mountain biking, hang-gliding, nature viewing, orienteering, and viewscapes. Located on Southern Vancouver Island and adjacent to the renowned Gulf Islands, this area is one of the most scenic, yet un-crowded, marine areas in the world. 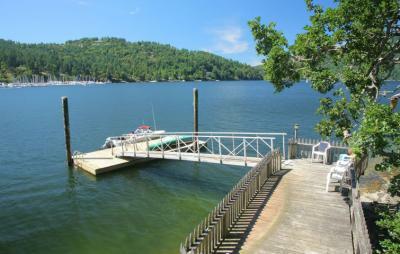 Visit Bird's Eye Cove and experience for yourself the fantastic quality of life enjoyed on the magnificent West Coast.